What the hell is going at the moment? 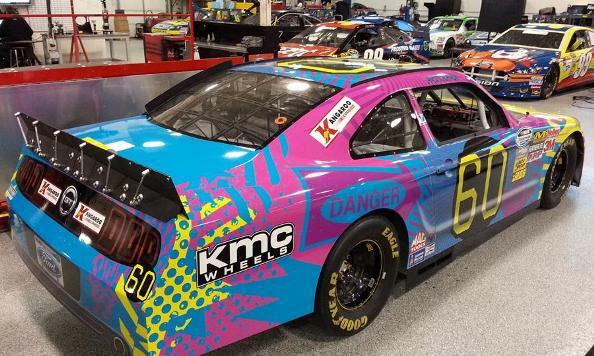 First Ken Block reveals his Miami Vice and Hair Metal-inspired Hoonigan Fiesta. Now Travis Pastrana has gone full-on 1980's with his 2013 NASCAR Mustang. 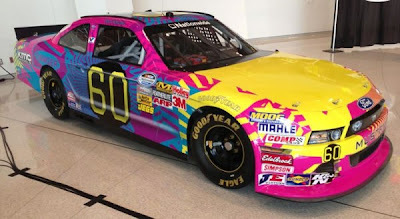 “I said, ‘I want it bright, I want it bold, and I want it ’80s.’ It’s a little pinker than I had originally planned. 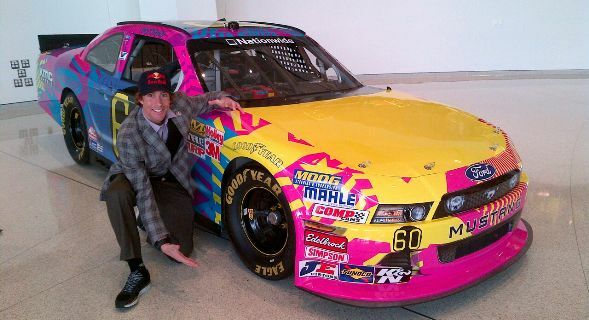 I think that was the guys just thinking they were going to try to get me beat up at a NASCAR race,” said Pastrana. Last year, Pastrana had a disjointed NASCAR program with a Boost Mobile Toyota Camry that was disrupted by injury and commitments to the Global Rally Cross Championship. For 2013, as a driver for Roush Fenway Racing, Pastrana has signed up for a full NASCAR series. With a colour scheme like that, we certainly won't be able to miss him. Time to get that '199' sticker sorted out though, Travis!